Gold Fleet was dominated by the East Team whilst in the Silver Fleet, West produced a clear run of consistent wins. The Holt Cup, was held at the Royal Navy Sailing Centre, Whale Island over the weekend of 17 & 18 Feb 18 to coincide with the RNSA AGM and Dinner. Prior to the event, 6 teams were already signed up, but due to and number of additional individuals turning up ‘on spec’, a 7th team was added into the mix making up a ‘Mixy-Blob’ team for the first day. To our surprise we found about 5 or 6kts of wind from the southwest which was consistent enough to make a start. Thankfully, the wind held for most of the day allowing one complete round of racing and giving sufficient time for the competitors to return all the kit and proceed to the AGM and Dinner. 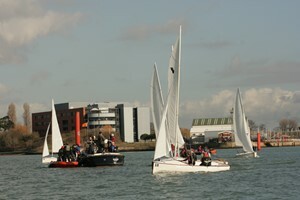 or the second day was to split the teams into a Gold and Silver Fleet to race for the Cup (Gold Fleet) and Plate (Silver Fleet). In the Gold Fleet was East, North and the Bristol URNU A, whilst the Silver Fleet consisted of West, Southampton URNU and Bristol URNU B; the Mixy-Blob team retired. The weather was looking a little better for racing with a consistent 7-8kts from the East and plenty of water to race on over the mud area in the harbour. With the lack of sun, it was a much colder day but there was good racing and lots of banter on the committee boat to make the day pass quickly. It became clear from the early races that East and North were the dominant teams in the Gold Fleet whilst West was clearly ahead in the Silver. In total, 18 races were completed, 9 for both fleets allowing a good opportunity for the teams to recover from mistakes.